The hardest challenge I have ever had to face was the decision to try to get pregnant again, and then the actual pregnancy itself. Before our sweet baby girl came to us I had had two early miscarriages in a row. My first miscarriage was what they term a missed miscarriage. The baby had stopped growing earlier on, but my body still acted as if it was pregnant. I found out when I thought I was about 12-13 weeks pregnant. I had went to the ER because I just felt something wasn't right even though I had no outwardly symptoms of a miscarriage. The ER confirmed what my instinct seemed to already know- my baby had stopped growing around 7 weeks. A couple of days later, I went to the women's clinic at the same hospital and received my only picture I would ever have of that baby. My tiny, motionless little Peanut. Floating. My second miscarriage happened almost exactly one year to the date from my first one. But this one happened much more quickly, and naturally. I was 8 weeks pregnant and started spotting and cramping. I lost Blueberry that same weekend. Two miscarriages in a row combined with my age and the fact that I had a healthy 12 year old son put me into the secondary infertility category. My OB ordered every blood test possible- everything came back normal. She performed a saline sonogram- everything looked normal. And she said to go ahead and try, that she would see me for my first prenatal appointment. Never had more hopeful and fearful words been spoken to me. We had no answers, no reasons why but she wanted us to just jump right in there again and try. We fortunately got pregnant right away... with the quintessential honeymoon baby. The first trimester was one of the hardest and one of the most blessed things I have ever had to experience. 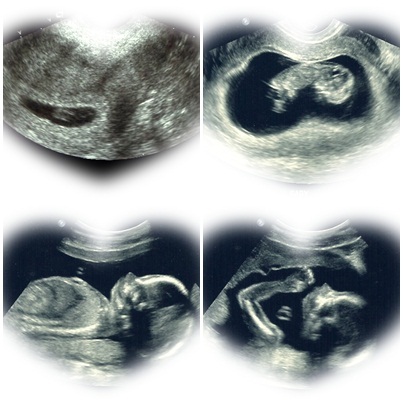 Each ultrasound started with anxiety, fear, sometimes panic, and ended with relief and joy. Wow. I'm glad you're able to enjoy your daughter. I'll be thinking of you as you and your husband decide whether or not to have another child. I know how stressful a pregnancy is after a miscarriage. It haunts you. I can understand how you would be nervous thinking of the future options and choices. I'm happy you were blessed with a little girl. Enjoy her and see where life takes you. Enjoyed seeing the pictures of your baby girl developing. Even the picture on the top right I can see her face. That's really cool! It's amazing how different each picture is from the previous one...yet - in the greater scheme of life - happening so quickly. Thank you, everyone for your kind words. I really do appreciate them. <3 We feel so blessed with our little family.